The ships of the Loch class of A/S frigates represent the final product of wartime design of frigates. They were designed to be mass produced in sections at dispersed sites and transported to an assembly point at a slipway. Welding and riveting were used to speed production and a team of 60 men could build a ship of this class. With a single 4” gun on the focastle for surface action, the main weapons were beyond doubt the twin squid anti-submarine mortars, along with the high mounted rapid firing twin 20mm guns for anti-personnel work. Only 28 Loch class ships were completed as Loch class frigates and a further 19 finished as the Bay class. As completed the ships displaced 1435 tons. The power was supplied by four cylinder, triple expansion engines (yes that is correct) of 5,500 ihp driving two shafts giving a speed of 19.5 knots. Weapons fit was a single 4” mkv, a quad 2pdr, and 4 x twin 20mm Oerlikons. Two 3 barrel squid mortars were fitted forward and two D/C mortars fitted to the quarter deck with a single D/C rail aft. Following the end of hostilities many ships were laid up or sold. The LOCH KATRINE was transferred to New Zealand in 1949 and renamed the H.M.N.Z.S ROTOITI. 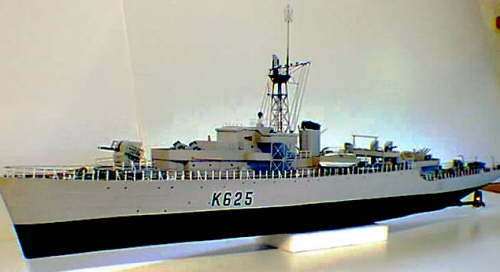 She was broken up in Hong Kong in 1962. The fibreglass hull in this kit is with full plating and port detail. The lattice mast, such a notable feature of this class of ship is assembled from etched brass in four parts for simple assembly. Propshafts in stainless steel are cased in brass proptubes with fitted oilers and replaceable bearings along with rudder and tiller arm. A colour chart and a set of precut decals for the pennant number are included in the kit to add the finishing touch to this most attractive addition to our warship range.